I really hemmed and hawed about going out at all, as on January 30th I came down with whatever it is that's going around, and really didn't feel up to snuff even by last night. But it had been an extremely stressful week (the expected layoffs came to our office and five of our people were let go, including two of my bosses who really made that place a joy to work at), and I really needed to get out and just spend time with God in His Creation, so based on the fact that I needed several sparrows for the year and wanted to try for some of the rarities still being seen along the route, I opted to do the Sparrow Road Route, which stretches from US 83 in La Joya all the way up to FM 490, basically along FM 2221 to Jara Chinas Road with a couple of side trips. 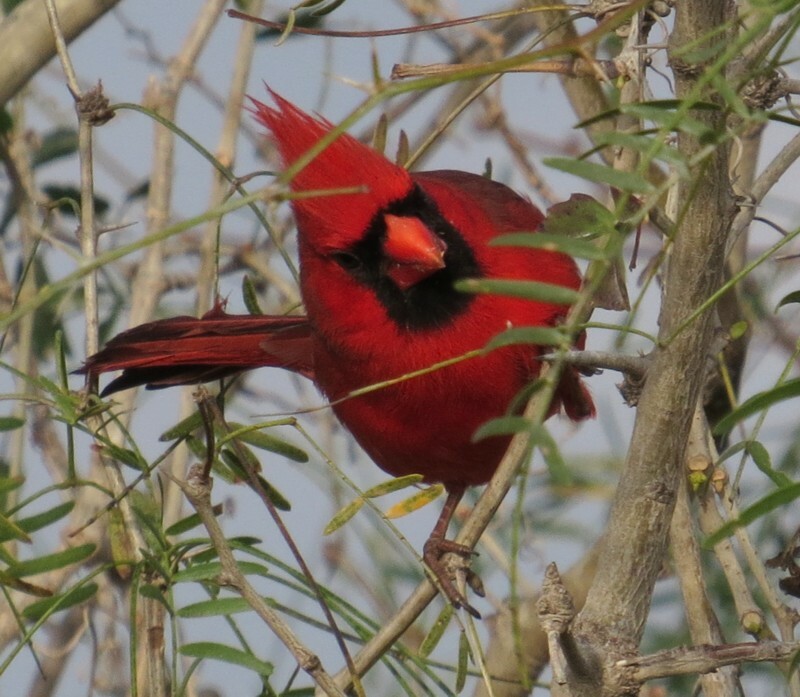 It was really a beautiful day: temperatures were tolerable (starting in the mid 50s and ending in the mid 60s), and it was mainly cloudy with a few peeks of the sun, but the wind never became stronger than a nice breeze, so it was very pleasant. However (as Pat and I noted the last time we did this), traffic along the paved portion (which is the north/south portion of FM 2221) has really gotten terrible; there wasn't a stop where vehicles were going by almost constantly! I don't remember it being that bad (at least on the weekends), and it almost prompted me to dispense with that part of the route in the future, but there's such good habitat along portions of it (especially the expansive grasslands as you approach the intersection with the dirt road), that I hesitate to do that; although I didn't pick up any today, this is prime Grasshopper Sparrow habitat, and I did pick up several Cassin's, Savannah, and Lincoln's Sparrows here. In the larger trees towards the south end of the route were Olive Sparrows, Green Jays, and two pairs of Kiskadees having words; the thornscrub yielded the first Black-throated Sparrows, Pyrrhuloxias, and Verdins of the morning; and the open areas had singing Eastern Meadowlarks and Loggerhead Shrikes (in addition to the aforementioned sparrows), and a flyby Krider's Hawk and Harrier. Once on the dirt portion (which is a great graded road, and it looks like they just graded it, too) the traffic was blessedly minimal. 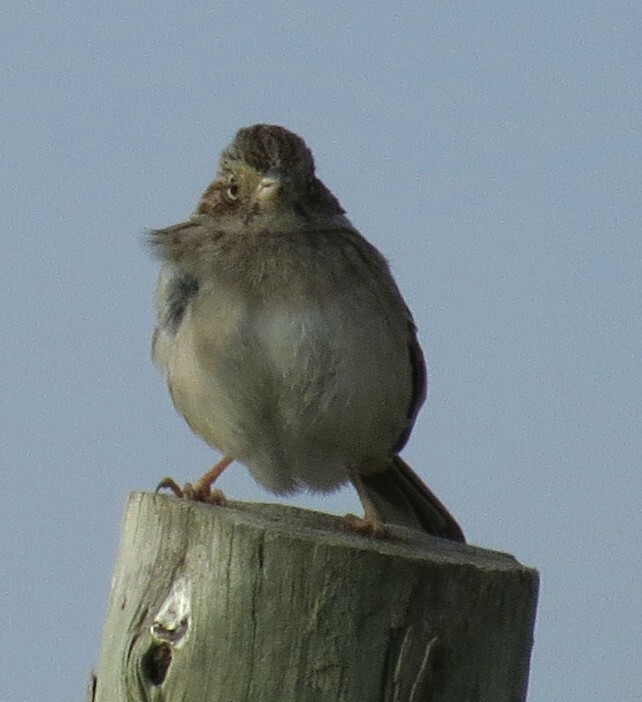 This stretch is mainly thornscrub habitat to start off, and was pleased to pick up several more Black-throated Sparrows along the way, along with some Bewick's Wrens and more Cassin's Sparrows, Pyrrs, and Verdins. 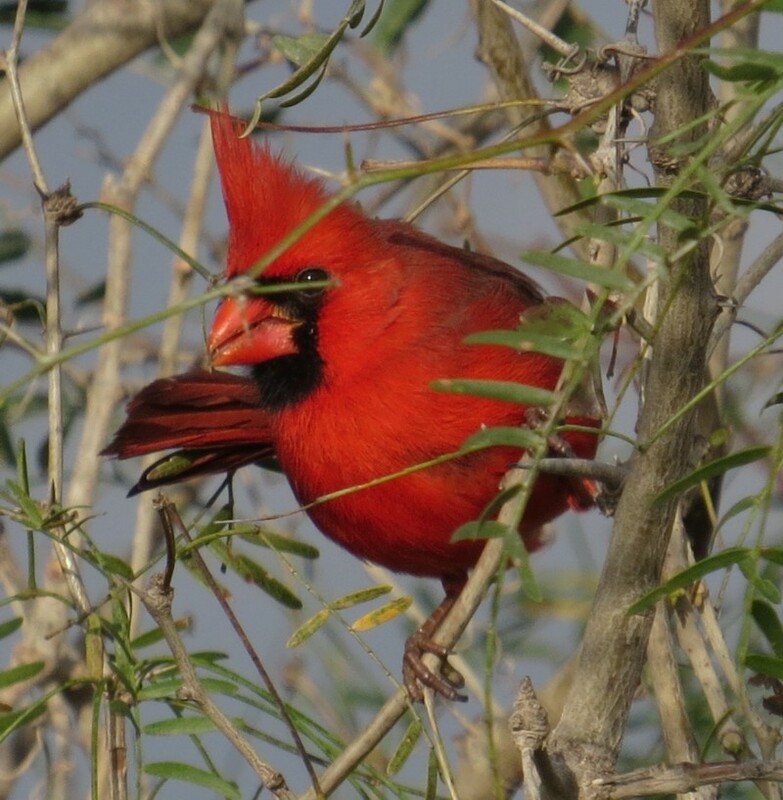 At one stop a Cardinal popped up in response to pishing along with one of the many Lincoln's Sparrows! Another stop had a calling Greater Yellowlegs in the distance; that's about the only way you're gonna get any shorebirds on this route (aside from Killdeer, of course)! About this time I passed a pickup with two guys who were birding (turned out to be Winter Texans), but they hadn't seen much of anything (they were more interested in photography). I told them what I had seen so far, and as we kept leapfrogging they happened to pull up right when another Black-throated Sparrow popped up for them! ☺ They were happy campers! 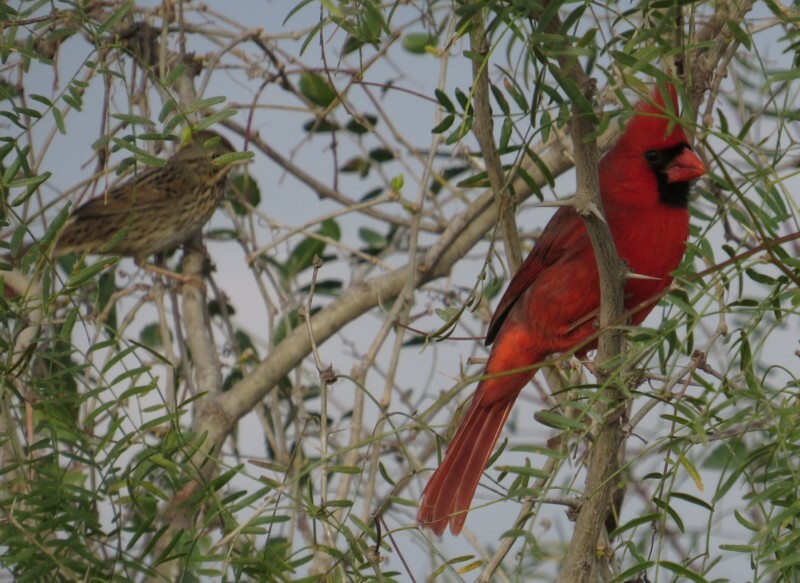 Shy Lincoln's Sparrow on the left, and a Cardinal on the right. After he realizes it's just a silly human making the noise, he gets down to the business of breakfast! The next stop happened to be just outside a busy ranch gate (the big rigs do like to thunder down this road), but it was a sparrow bonanza with at least five different species (White-crowned and Chipping were good for the year), along with a female Lesser Goldfinch that practically landed on me (I think I was parked too close to her sunflower plant ☺)! Unfortunately the flock was on the east side of the road, moving in and out of the thornscrub, and they would explode every time a vehicle went by, so it was tough to determine exactly what I had (I thought I may have had a Clay-colored, but just couldn't get a good look before he flushed). There was even one sparrow that I was trying to turn into a Brewer's, but again, it just wouldn't let me get a good look. 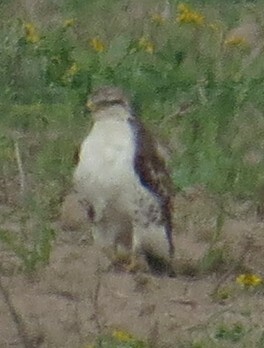 Red-tailed Hawks abounded along this stretch as well. 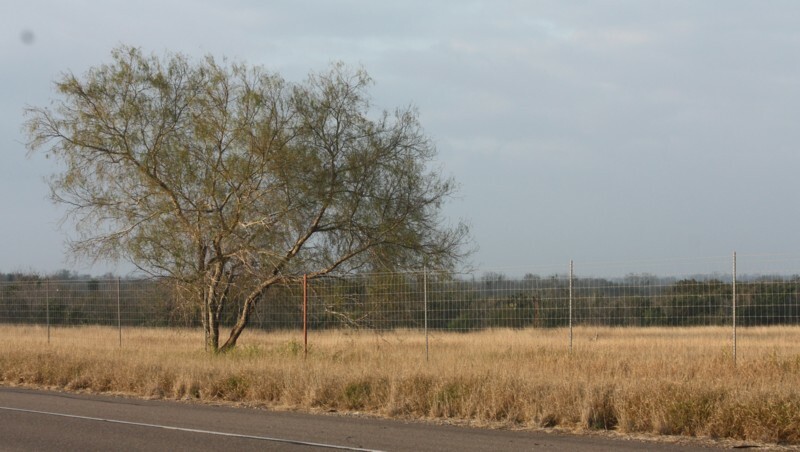 You go through some pretty barren fields before hitting the T at Mile 14 Road, and this is where I take a little jog to the west to just past the Starr County line (far enough to be able to turn around at the next dirt road). More barren fields to start with, yielding only some Horned Larks and the occasional American Pipit, but there was a nice White-tailed Hawk wheeling in the distance. Shortly you come to more good thornscrub, and it's here the Birder Patrol had a surprise Sage Thrasher a few years ago! No such luck this time, but the Mockingbirds were out the yin yang: at several stops I had at least five or six birds chasing each other back and forth and scolding! Had a distant hovering buteo at one stop, and I remembered the bygone days as a kid with the old Peterson field guide declaring that Rough-legged Hawks were the only buteos to hover! 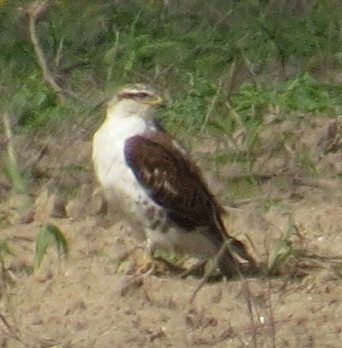 That, of course, is no longer gospel, as personally I've seen several Red-tailed Hawks hover, but I did wonder if it could have been the Ferruginous Hawk, as it looked very pale! 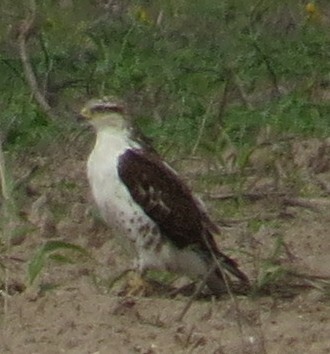 It was facing me and swooping closer after each hover, but it wasn't until it flipped around that it actually appeared to be a White-tailed Hawk, but yet the ventral side just didn't look right, plus I had never heard of them hovering! This is also where the road becomes less "civilized", and indeed there were a couple of bad wet spots before the turnaround point, but nothing Diggory couldn't handle! ☺ Also got the day's only Long-billed Thrasher in here, along with more Black-throated Sparrows and Bewick's Wrens, plus a singing White-eyed Vireo and chattering Ruby-crowned Kinglet. Backtracking (and almost nailing a Roadrunner), I passed the T and turned left on unmarked "Telegraph Road" (look for the line of telephone poles and you can't miss it), where at least three Vesper Sparrows popped up on the corner, and at least one White-fronted Goose called in the distance! The two Winter Texans caught up with me at that point (it was truly a "tortoise and hare" scenario: they were the tortoise and I was the hare...), wanting confirmation that this was the "Mountain Plover" road and that it would connect with 490 (yes indeed)! They went on ahead and must have wondered why in the world I would be stopping in this barren wasteland, but in reality you never know what could pop up in these fields (it's definitely Horned Lark Heaven there, and had a couple of Caracaras and several Kestrels to boot)! Another unmarked road to the west makes a "square" and dumps you back off on "Telegraph Road", and again, you think you're wasting your time, but I've had anything from gobs of Cassin's Sparrows to Long-billed Curlews to Sandhill Cranes back there (if nothing else, you are going to get Horned Larks, and tons of 'em at that)! 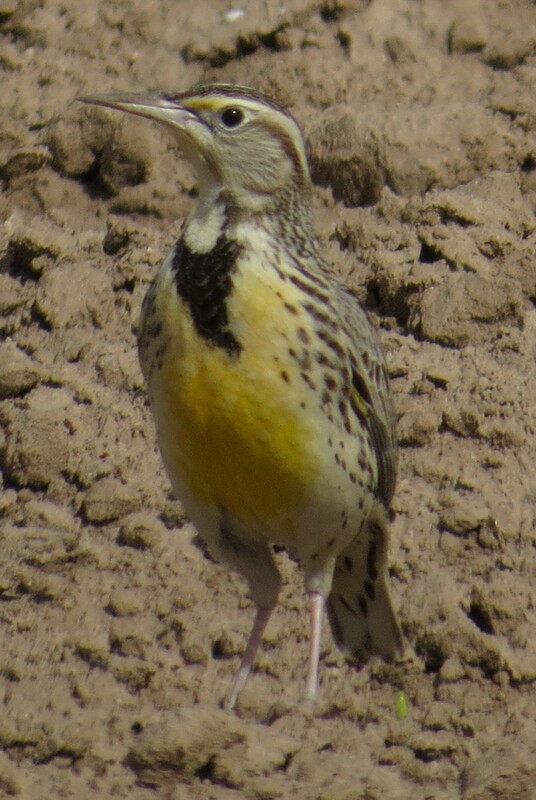 This time yielded the only Western Meadowlarks of the morning that gave great roadside looks, along with a large falcon in the distance that was stooping, sailing, soaring, and at one point being harassed by something! It was way too far away to determine species, even with the scope, but knowing that a Peregrine has been hanging around the area along with the sought-after Prairie, I wasn't going to call it either/or at that point. Unfortunately, it didn't show itself again as I continued north on "Telegraph". 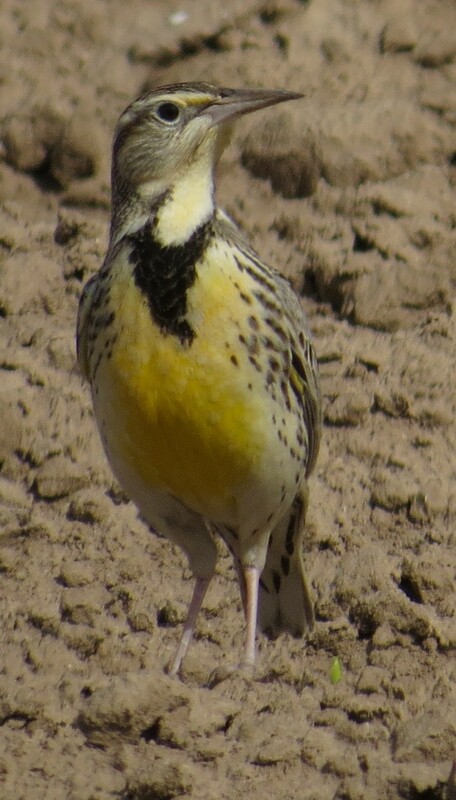 One of several Western Meadowlarks along "The Square". Onward to the "Mountain Plover Field", where the next half-mile stop just happened to be right where Bob and Bert had spotted them when we were out there a couple of weeks ago! Unfortunately I couldn't find a thing except pigeons, and I was just about to head on when I noticed a white blob out in the field; a look with the bins made me suspect that it was the immature Ferruginous Hawk that's been hanging around, and a look through the scope confirmed it! So I was very pleased to bag at least one of the target rarities for the route! Not the best shots, but at least identifiable of the young Ferruginous Hawk; you can see the feathered tarsi on all the photos, but on the far left one you can just make out the long gape, which is also diagnostic for this species.